Rebecca Gordon is the publisher & editor-in-chief of Rebecca Gordon’s Buttermilk Lipstick, a culinary & entertaining technique driven brand she founded over 5 years ago that reflects her seasoned, traditional magazine publishing background by merging it with the benefits a digital title offers. She is also a media personality, published cookbook author, culinary consultant, classically trained pastry chef & southern lifestyle expert most specifically known for tailgating & southern college football. Rebecca Gordon’s Buttermilk Lipstick is a culinary & entertaining brand featuring cooking & baking tutorials for everyday cooks. The southern lifestyle title focuses specifically on service for the purpose of providing the most accurate & extensive visually driven digital food content instruction in the culinary arts & entertaining landscape across the internet with the hopes that new information is learned & successful results are achieved when put into action by the reader. From southern-style entertaining driven menus & special occasions to the basic fundamentals of preparing everything from homemade yeast breads & how to select the perfect peach for a lattice topped pie, Gordon, a former test kitchen director of a national media brand, covers it all with original content published daily. 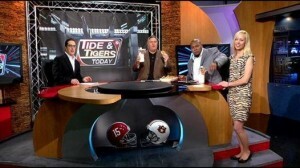 From 2012 thru the 2016 football season, Rebecca Gordon developed, produced & hosted Game Day Entertaining featuring Buttermilk Lipstick tailgating recipes, Alabama & Auburn based party menus & football social crafts on Raycom Sports, WBRC Fox 6’s Tide & Tigers Today with Sports Director Rick Karle. During her first season with the show that aired in markets across the southeast, she joined national radio personality & ESPN/ SEC Network sports correspondent Paul Finebaum in the kitchen. From 2013 to 2016, she joined Auburn football alum Tommy Jackson & Alabama football alum & star of NBC’s The Biggest Loser, Roger Shultz. Gordon continues to share her passion for college football each season & honors the Tide & Tigers Today show spirit by creating, producing & publishing the tailgating driven party menus that started it all– weekly game plans featuring Alabama & Auburn recipes that speak to their matchups on Rebecca Gordon’s Buttermilk Lipstick– the foundation for which the brand was originally built. Her original recipe collection, which features everything from game day fan-fare to classic cooking & baking specialties, offers the most extensive how-to style recipe format approach across the internet & is presented with a strong focus on teaching the basic fundamentals in preparation or entertaining execution. Recipes, menus & ideas are pulished daily with a seasonally driven, tutorial or entertaining based theme along with a bit of charming yet modern southern hospitality sprinkled in throughout the year. When it’s not football season, you’ll find her teaching featured techniques & entertaining ideas monthly on traditional broadcast platforms such as WBRC Fox 6 Good Day Alabama & ABC 33/40 Talk Of Alabama. Prior to launching Rebecca Gordon’s Buttermilk Lipstick, Gordon served a 13 year stint with the Time Inc brand Southern Living. She traveled the South as a presenter of recipe demonstrations with the advertising-based Southern Living Cooking School program & worked in the kitchens on the editorial side, serving as Test Kitchen Director. She managed the daily operations which included recipe testing & development, food styling, developing & writing content for the magazine & southernliving.com, led taste testings prompting reader focused discussion with the food staff & managed food photography logistics. She represented the brand on an array of media platforms including television, web videos, books, marketing events, radio & print & web interviews. 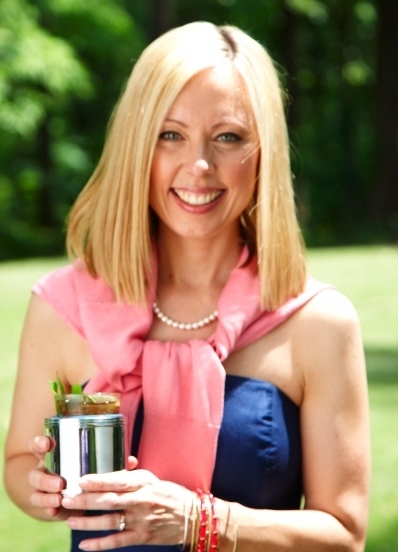 Rebecca Gordon, also known as Rebecca Kracke Gordon, shares 30-minute recipes & great party ideas in The Half-Hour Hostess & was the spokesperson for the original printing of the 2012 best seller, The Official SEC Tailgating Cookbook, published by Oxmoor House. She spearheaded collaboration & content development for each of the Southeastern Conference schools in recipe selection & development. She served as a liaison between the brand & the SEC & was the first reporter to cover SEC Media Days from a lifestyle angle interviewing several coaches including Nick Saban. She also produced brand driven content & co-hosted, Southern Living’s Tailgate Playbook, in 2012 on Great American Country channel with Nan Kelley. 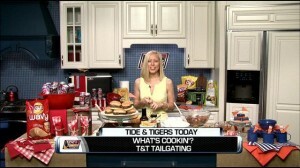 Rebecca Gordon in the Tide & Tigers kitchen hosting game day tailgating.